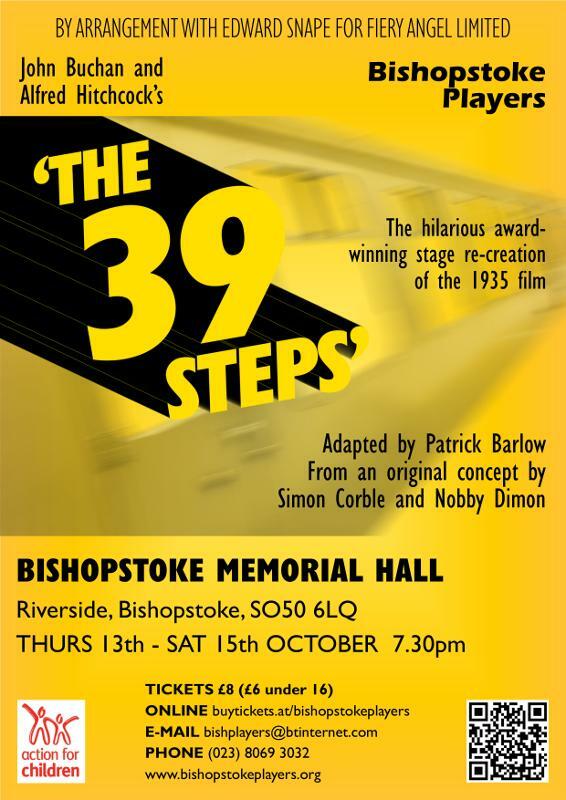 Alfred Hitchcock’s classic 1935 film thriller, “The 39 Steps”, has been brilliantly and hilariously recreated for the stage by Patrick Barlow, Simon Corble and Nobby Dimon. Nothing has been cut from this hilarious version of Britain’s most spell-binding thriller, based on John Buchan’s gripping whodunit of the same name. Legendary scenes include the chase on the Flying Scotsman, the escape on the Forth Bridge, the first theatrical bi-plane crash ever staged and the death-defying (or nearly!) finale at the London Palladium! Coordination, characterisation and comic timing are the key ingredients for Alfred Hitchcock’s classic comedy thriller ‘The 39 Steps’. 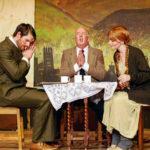 The Bishopstoke Players have certainly mastered this recipe! 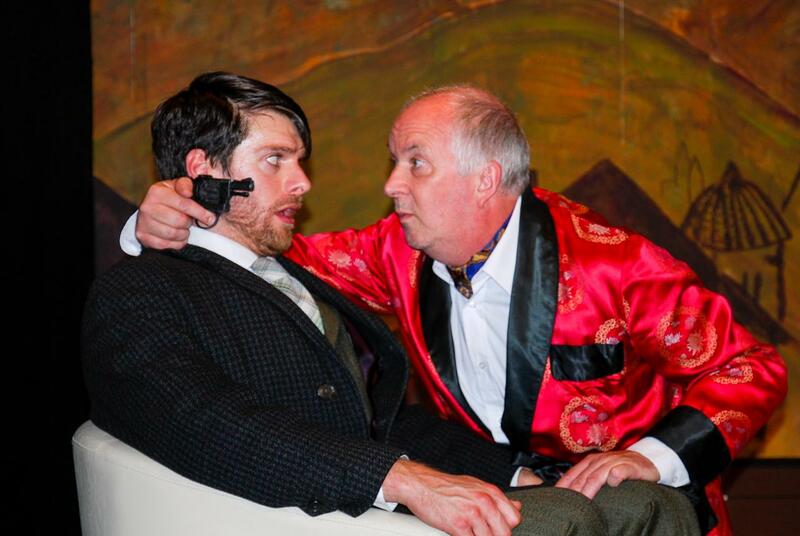 We follow the adventures of our well-to-do hero Richard Hannay as he finds himself in the centre of a murder mystery investigation, along with secret agents and of course pretty women. The concept of the play calls for only a cast of four – one actor who plays Hannay, an actress who plays three female roles and two other actors who change quickly between playing heroes, villains, men, women and objects! 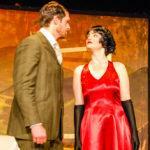 For their opening night, I expected there to be few missed cues or perhaps some lost lines. 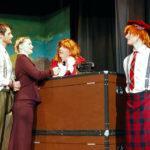 However, The Bishopstoke Players certainly pulled out all the stops with a well-rehearsed and slick performance. James Gould (Richard Hannay) gave a refined performance as the hero of the plot, with Kate Robbins (Annabella/Margaret/Pamela) bringing a touch of elegance and great characterisation to her various roles. 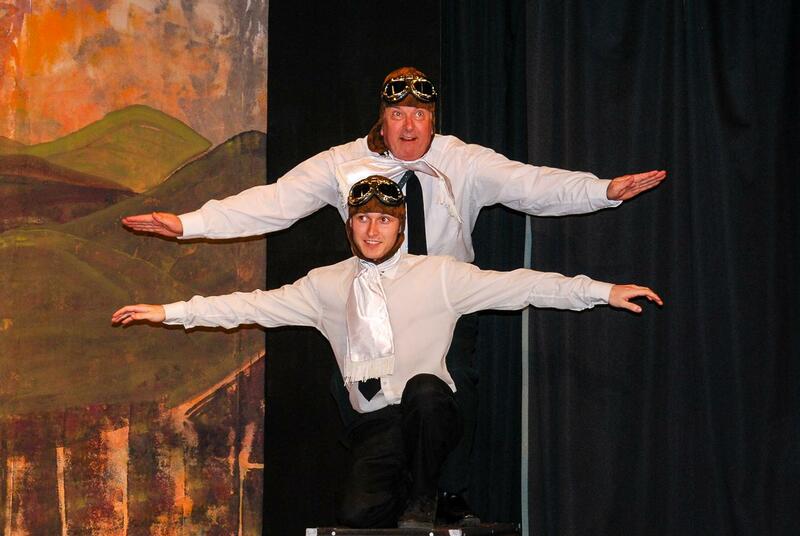 The most comedic moments came from Rob Beadle (Man 1) and Peter Burton (Man 2) who’s comic timing and quick changes of character were smooth and effective, leaving the audience in hysterics at various moments during the play. 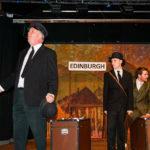 This was well supported by a strong and confident technical team which delivered faultless lighting, music and scenery cues. 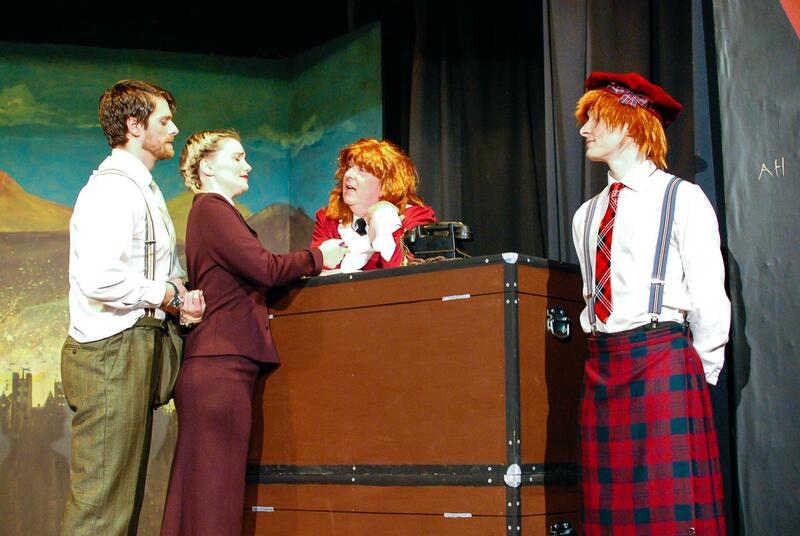 Although some parts of the show seemed quite laboured in places, the talent, effort and energy of the cast did not go un-noticed and a fantastic final applause from the audience just goes to show that hard work pays off. An entertaining evening to be enjoyed by all ages. 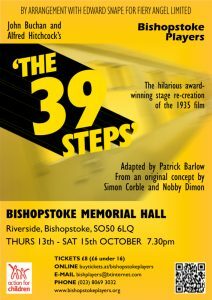 ‘The 39 Steps’ will be running until Saturday 15th October 2016 at Bishopstoke Memorial Hall. All profits go towards supporting Action for Children. BASED on the John Buchan novel and the subsequent Alfred Hitchcock movie, this 4-hander stays very true to the original story set in a 1935 that seems alien to our more liberal times. 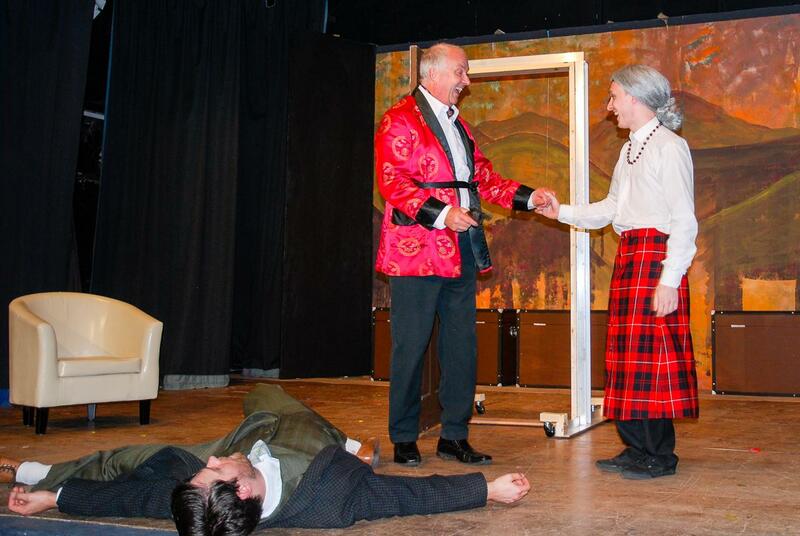 Exploiting these differences, Director Barry Kitchen has utilised the basic facilities of the Memorial Hall stage to full advantage allowing a packed audience to fully engage with the absurdities of the plot, whilst being amused by the spoof aspect of the sensibilities of the age. James Gould remained in perfect character throughout, clambering in and out of windows and running (a lot) whilst Kate Robbins, Rob Beadle and Pete Burton clambered in and out of costume and scenarios as the characters he meets along the way. 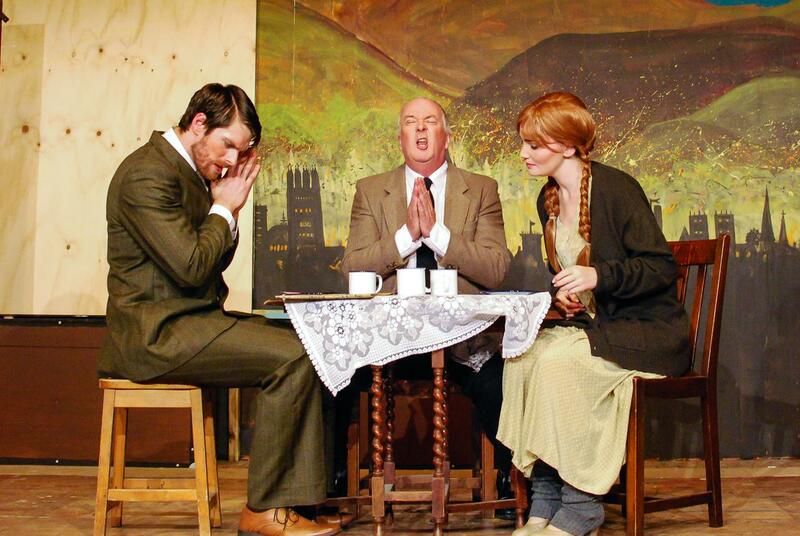 The railway carriage scene was very effective, all 4 performers giving their all not only there but throughout, as the frenetic conclusion loomed. Boy’s Own and Stiff Upper Lip stuff indeed! John Buchan’s adventure story has had several re-incarnations since its original format as a serial in Blackwood’s Magazine back in 1915. It is the first of five novels featuring Richard Hannay, an all-action hero with a stiff upper lip and a miraculous knack for getting himself out of sticky situations. Since the original story, it has been adapted for the radio and re-made as several films (including Alfred Hitchcock’s famous 1935 version), as well as different stage versions. 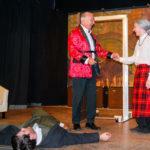 One of the more recent versions is a comedic adaptation by Patrick Barlow for just four actors, and it is this version that the Bishopstoke Players have chosen for their current production. On arrival, the audience is greeted by a relatively bare, open stage – just threee trunk boxes tucked away at the back against a nicely painted scene. 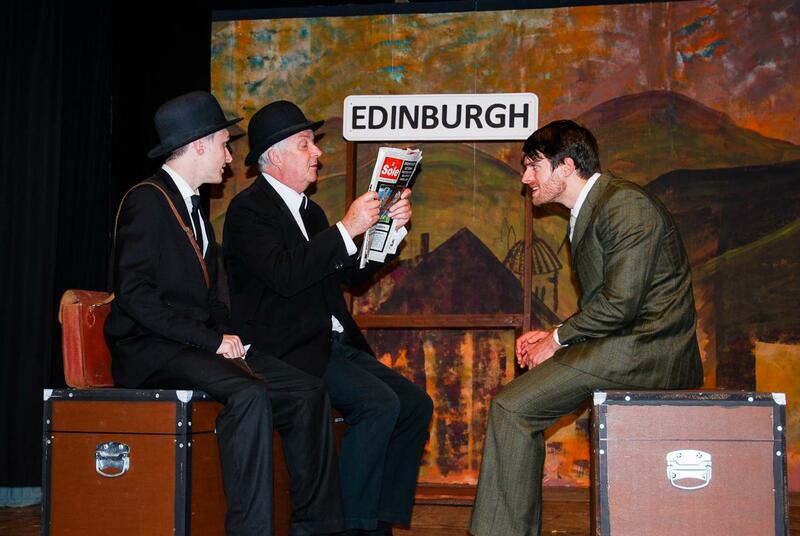 These boxes are well used during the performance, as they help stage the many individual scenes. However they don’t work as hard as the four actors, only one of which takes the same role the whole way through. 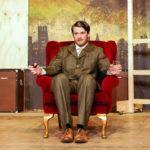 James Gould plays Hannay with just the right amount of Britishness, portraying the unlikely hero beautifully. As for the three other actors, you quickly lose count of the number of parts they actually take as the performance progresses – not to mention the differing accents they have each mastered. It is lucky that Kate Robbins and James get on well, with Kate playing the different romantic interests that Hannay encounters on his adventures. 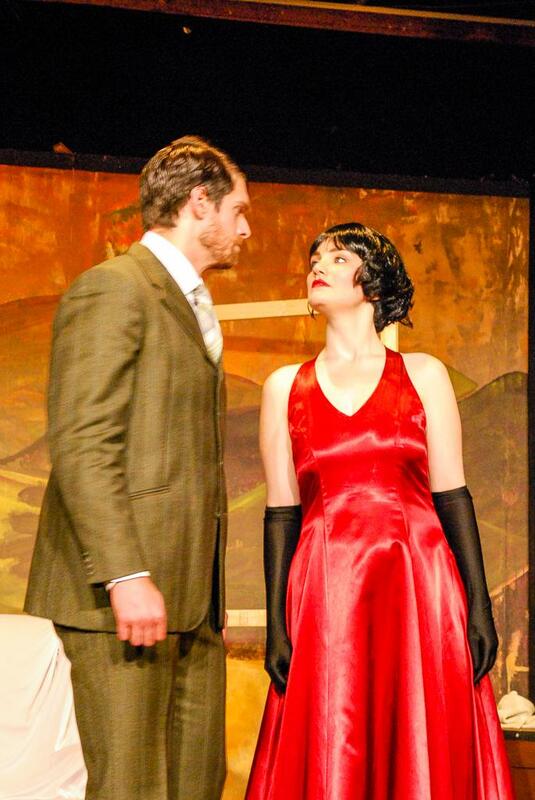 The genuine connection between this pair comes across to the audience. 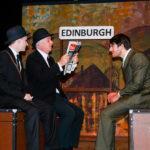 Rob Beadle and Pete Burton play the many supporting roles with breakneck speed, flitting between different characters right before the audience’s eyes. Both deliver their characterisations delightfully, and have many comic moments on which they capitalise as best they can. 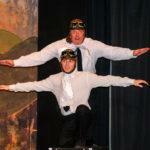 This was an opening night performance and there were a few minor issues, particularly with shifting scenery around, but the actors have the opportunity to make this add to the comedy of the piece. The pace dropped at times, possibly to try for more laughs, but more likely as the actors caught their breath. Barry Kitchen’s direction sees the actors being worked exceptionally hard on the stage – sometimes putting their bodies into seemingly impossible positions – but the effect is very good for the audience, and whilst much of the play is performed towards the rear of the stage, the real gauge of the piece comes from the constant chuckling from the audience. 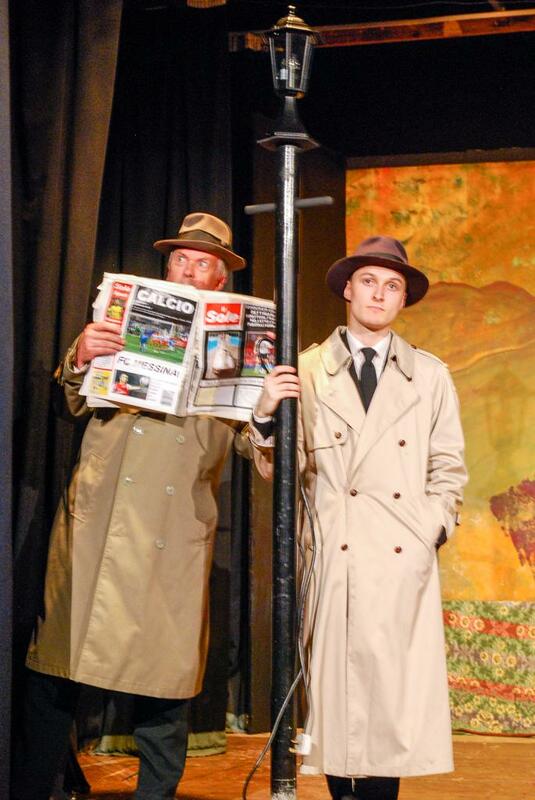 The Bishopstoke Players list just 40 members on their website, and many of them will have been involved in this production in one way or another. Whilst it won’t be the most polished version you’ll ever see, these are amateurs putting heart and soul into their performances, and are more than worthy of your support and applause. Future performances: 14 and 15 October at 7.30. I travelled to the little village of Bishopstoke, one mile outside Eastleigh near Southampton, not quite knowing what to expect. 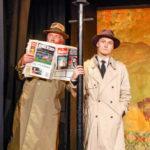 I have seen The 39 Steps performed on numerous occasions, and had also been a ‘visible’ scene shifter in a version that played at the Minack Theatre in Cornwall. All four actors were very competent and knew exactly what was desired of them, changing from character to character at the drop of a hat (literally). The director also new the script very well in order to add in all the little bits of ‘visual’ which aren’t always clear within the printed script. 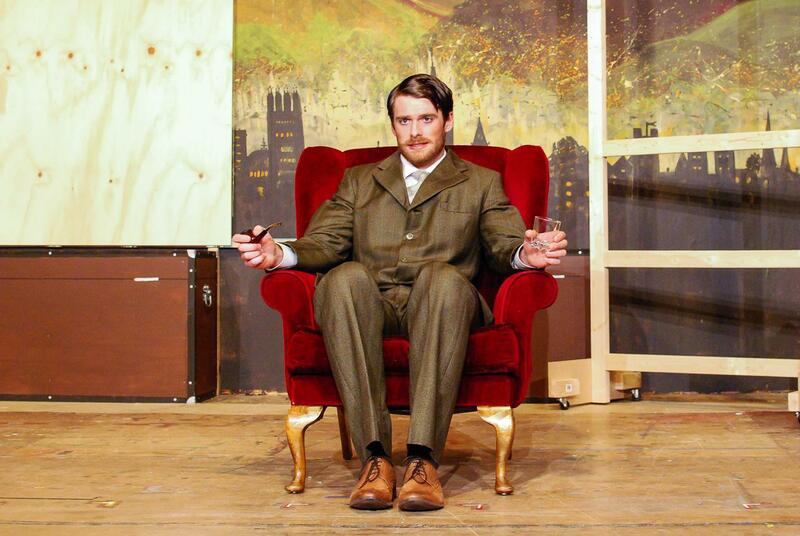 James Gould, was perfectly cast for the role of Richard Hannay with his British stiff-upper-lip look. He was the only one in the show that played just the one character throughout, and he played it brilliantly. Rob Beadle and Pete Burton played the parts of Man 1 and Man 2 respectively, not much of a name for such characters, but very apt as they played the rest of the male (and female in places) cast, from newsboy to underwear salesmen, spies, policemen, police inspector, sheriff, villain, crofters, Scotsman, Scotswoman and villain’s wife. They both played each of the characters very differently, most time just by changing hat, body language and accent. They were both on the ball throughout. Kate Robbins also played three different roles, Annabella, Margaret and Pamela, which she played with aplomb – it’s surprising what you can do with three different wigs and accents. Barry Kitchen directed the whole show and was very astute on how it was played. 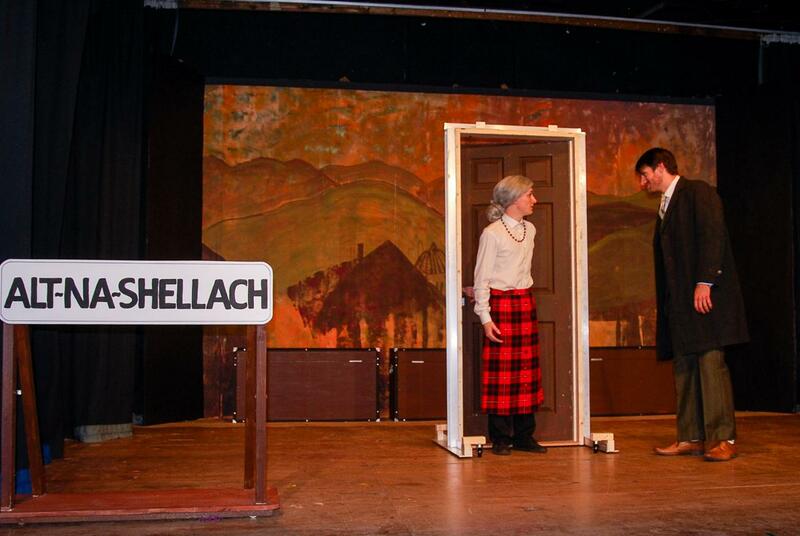 He had some great ideas for the different scenes using only three wooden boxes, a backdrop, false window and doors and a few other props that were wheeled onto and off stage as the play unfolded. 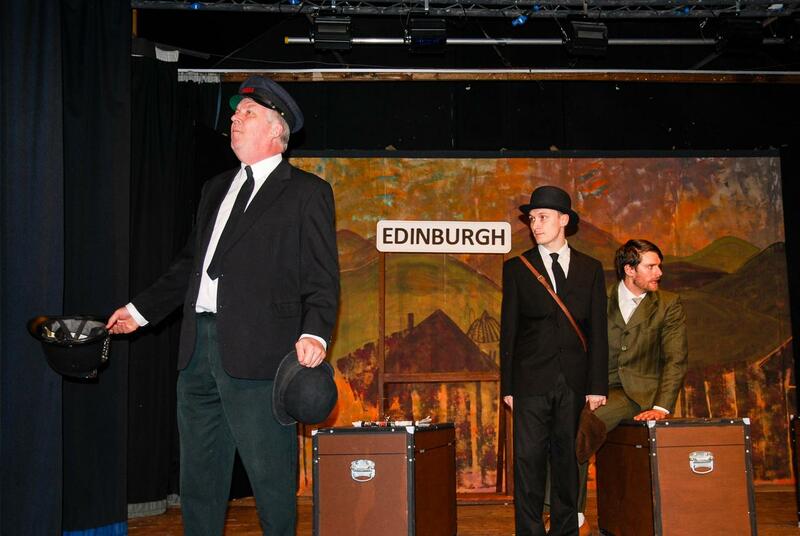 The scene on the train and Edinburgh Station was excellently performed, going at an excellent pace throughout whilst Beadle and Burton quickly swapped from character to character without leaving the stage, and in a couple of places, playing two characters at the same time. The acting right through was superb and the timing impeccable. 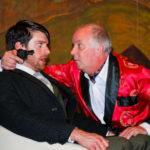 For a play like this, it is so easy to overdo things and all the humour consequently lost. However, the well-drilled cast worked fluidly together. 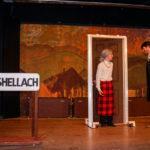 However, there were several moments in the show that pace was lost a little, namely the Scottish hotel scene – it just seemed to bog down a little bit, but it could just have been a first night glitch. All in all, I thoroughly enjoyed my evening trip to Bishopstoke and was well rewarded with the entertainment they provided.